Can you believe it's already Thursday? It feels like yesterday that I was sleeping at my desk after Labor Day weekend! Leon Rich sounds pretty interesting (even though is clearly a music-lesson-and-message guy). From what I can tell, he loves variety in song styles (Is that some whiteboy funk, Leon?) and has a good anti-establishment bent. I wonder if you have to be a stoner to receive a best song nomination from MassCann/NORML? "Queen for a Day II"
Hey, Freddie Mercury would've been 62 on Friday. I think we can all agree that Freddie loved to party! Big Moves – undeniably Boston's best "plus-sized" dance troupe -- have organized a soiree for the second year in a row. 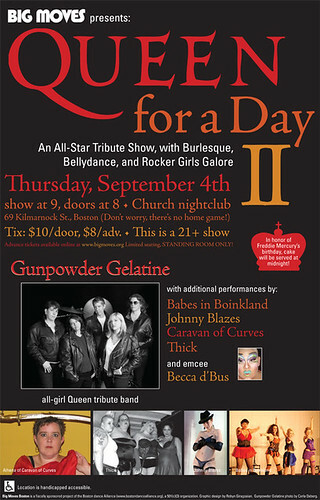 Our town also happens to be blessed with an all-female Queen tribute band, Gunpowder Gelatine, so we can hear a slew of their classics with slightly more estrogen than usual. Lotsa ladies of various shapes and sizes will shake their booties (and other parts) besides Big Moves in various configurations (including Caravan of Curves, their belly-dancing squad). I may be going out on a limb, but Johnny Blazes is a woman. The festivities will be emcee'd by Becca D'Bus, a "woman" after Freddie's heart.